I’ve decided to blog semi-regularly in the run-up to and during my trip to the World Cup. My free time has mostly been consumed by either watching games or getting ready for the trip, so I might as well write about it. I’ll try to get a few regular posts up as well. Why start days before I leave? Because I fear that if or when the USA loses to Ghana today I am going to be depressed so I might as well write while I’m still optimistic! My friends and I will be watching two games at the famed Estadio de Maracana in Rio de Janeiro. 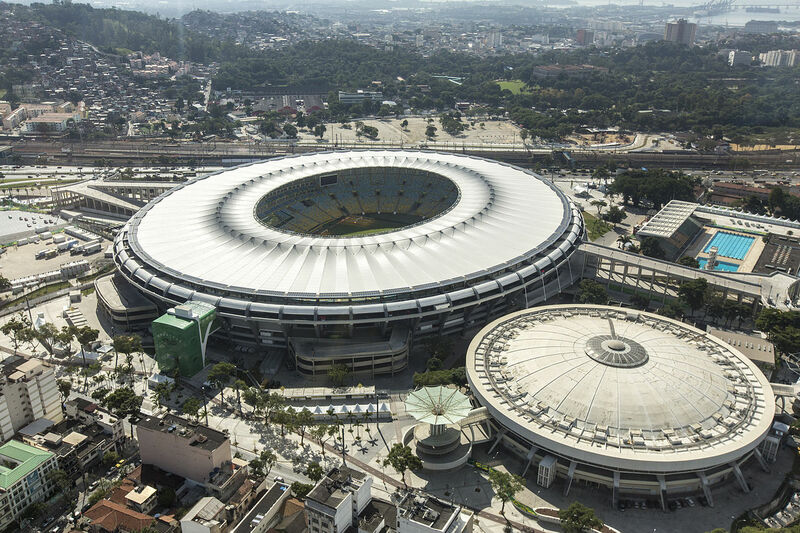 It is a stadium that was built in 1950 – the last time Brazil hosted the World Cup (and lost it to Uruguay). It is a beautiful stadium and watching Argentina play there today got me really excited for the games we will be going to. One thing I’ve been stressing about a little is getting to the stadium. Public transportation is what’s recommended, but how early should we leave? Rio has updated their Metro system, including new stations, just for this World Cup (and the Olympics). We’re staying in Ipanema so we technically should be able to get on at General Osorio and get to Maracana station with just one change. I’m leaning towards leaving about three hours before the game – hopefully that gives us enough time. I’d rather wait two hours at the stadium than miss part of the game. Plus, who doesn’t love the anthems? Over the next few days I’ll talk about how I’m treating my preparations for this trip a little differently than my normal prep – unless the US wins tomorrow of course. Then I’ll just be like “WOOO USA USA!!!!!!!!!!! !” So yeah, I’ll probably be back tomorrow talking about my preparations for the trip…..sigh. Rio built a new Metro system just for this World Cup (and the Olympics). Er…. the Maracanã station of the metro line opened in 1981. The Metro itself began in the 1970s. I believe they’re building dedicated bus/mass transit lanes for the Olympics and World Cup, and the Ipanema metro station only opened in 2009, but the Metro’s been around and functioning for a long time. Your big concern will be that the trains are overcrowded and not allowing more passengers on. I don’t know what steps Metro Rio is taking to alleviate congestion, and I’m not there, but I think leaving very early is a good precaution.